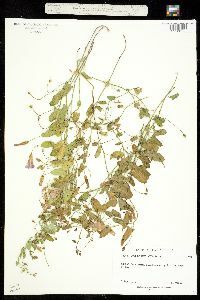 Plant: Rhizomatous, herbaceous vine; Wide-spreading; STEMS branched, decumbent or twining Leaves: variable, often ovate, ovate-lanceolate to elliptic, 1-10 cm long, 0.3-6 cm wide, entire or with the margins somewhat undulate, glabrous or inconspicuously puberulent, basally cordate to truncate, hastate or sagittate, the lobes obtuse or acute, entire or with 2-3 teeth, the petioles 3-40 mm long INFLORESCENCE: 1-3-flowered cymes; peduncles 3-3.5 mm long; bracts elliptic, linear or obovate, 2-3(-9) mm long Flowers: on pedicels 5-18(-35) mm long, erect or reflexed in fruit, usually glabrous, the bracteoles linear, 2-4 mm long; sepals obtuse, rarely truncate or emarginate, mucronate, ciliate, the outer sepals elliptic, 3-4.5 mm long, 2-3 mm wide, glabrous or tomentose, the inner sepals orbicular to obovate, 3.5-5 mm long, 3-5 mm wide; corolla campanulate, white or tinged with pink, 1.2-2.5 cm long; stamens 8-13 mm long, the anthers 2-3.5 mm long; ovary ovoid, glabrous, the style 7-10 mm long Fruit: FRUITS capsular, 4-valved, mostly brown, chartaceous, globose to ovoid, 5-7 mm wide. SEEDS 1-4, 3-4 mm long, black to dark brown, glabrous, tuberculate Misc: Cultivated fields, roadsides; 350-2350 m (1100-7700 ft); Apr-Oct REFERENCES: Austin, Daniel F. 1998. J. Ariz. - Nev. Acad. Sci. Convolvulaceae 30(2): 61. Perennial vine up to 1 m long Stem: twisting and twining, freely branching, often forming tangled mats, slender, usually hairless, and arising from very deep and spreading roots. If the stem is cut or broken, it exudes a milky sap. 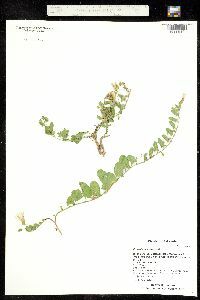 Leaves: alternate, stalked, non-toothed, mostly hairless, 1 - 5 cm long, longer than wide, variable in shape, but normally somewhat triangular with blunt tip, and two blunt, spreading or slightly downward angled, basal lobes. Flowers: many, usually singly in leaf axils (sometimes two or three), long-stalked (longer than leaf stalk), usually white but occasionally pink, 1 - 2.5 cm long, up to 2.5 cm diameter, radially symmetric, funnel-shaped. About 0.5 - 2 cm below each flower are two, small, 1 - 10 mm long, non-toothed, narrowly egg-shaped to very slender awl-shaped bracts. Sepals: five, appressed to base of flower, 3 - 7 mm long, elliptic to more rounded, with wide tips which are sometimes notched, or often abruptly short-pointed. Petals: five, but fused into a tube or funnel with expanded limb, which may be shallowly five-lobed or merely wavy along edges. Stamens: five, attached near base inside petal tube, not extending beyond petal tube. Pistil: with one, two- or four-chambered, superior, hairless ovary; and a single, slender, elongate style which ends in two linear or threadlike, somewhat flattened, 2.5 - 4 mm long stigmas. Fruit: stalked, four-seeded, one- to two-chambered, rounded capsules. Similar species: Convolvulus arvensis is most similar to two viny species of Calystegia in the Chicago Region, C. pellita and C. sepium, except those species, as all members of that genus, have large, obvious, leaf-like bracts positioned closely below the flowers such that the sepals are not visible. Some might confuse species of Ipomoea with C. arvensis, however members of that genus have sepals over 7 mm long, and the stigmas are rounded, not elongate. 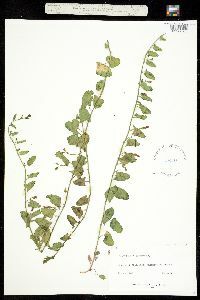 Habitat and ecology: A very common and aggressive weed, mostly found in cultivated ground and waste areas such as along railroads or roadsides, but sometimes along borders of woodlands. Notes: This is the only species of Convolvulus found in eastern North America. The other 200 or so species are all native to Europe, Asia, or Africa. The very similar genus Calystegia used to be included within this genus, but most experts now agree they are separate genera. This species is extremely variable in the shape of its leaves. We have specimens with leaves varying from 5 to 35 mm in width. It is an obnoxious weed wherever it is found. It is a plant mostly of waste places and along roadsides, railroads, streets, and alleys.